1. Place the onion slices in a medium bowl and toss with salt and hot sauce. Pour in the buttermilk, submerging the onions in the buttermilk/hot sauce mixture. Allow the onions to soak in the buttermilk for 15 minutes. 2. In another medium bowl, mix together the flour, salt, garlic powder and pepper. 3. Line a baking sheet or large plate with a bed of paper towels. To a cast-iron skillet, add oil until it reaches about 3-inches up the sides. Heat the oil until it reaches 360 degrees F.
4. While the oil is heating up, it’s a great time to make the ranch dressing. To a small bowl, add the yogurt, mayonnaise, salt, pepper, lemon juice and herbs. Mix until it’s thoroughly combined. Add the buttermilk and stir. Since I was using it as a dipping sauce, I favored a thicker consistency, but feel free to add a tablespoon or two more of buttermilk until you reach your desired consistency. Set aside. 5. When the oil is hot, remove the onions from the buttermilk and transfer them to the flour mixture bowl, dredging them on both sides until coated. Gently place in the hot oil until light brown on both sides, about 3 minutes, and turning them once. 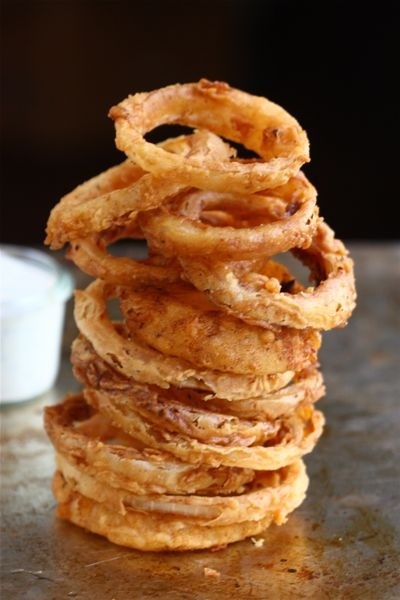 Transfer the onion rings to a bed of paper towels. Repeat until you’ve fried all of the onion rings. Note: This recipe is great to double. If you’re doing a bigger batch, I suggest heating your oven to 200F and transferring the done fried onion rings to the oven to keep warm while you continue to fry up the rest of them.